A very old English apple variety, apparently found on a Cumbrian rubbish tip in 1790. Keswick Codlin (Malus domestica 'Keswick Codlin') is an apple with pale green-yellow colour with a darker yellow flush. This apple cooks to a juicy cream froth and purée which hardly needs sugar. Good for jelly. Very profuse in flower and very heavy crops are generally produced. An excellent dual purpose apple. 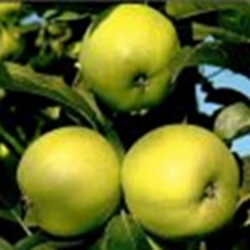 Self-fertile/Not self-fertile: This apple is self-fertile and will produce apples without the need of another apple tree nearby. This apple is in flowering period is C1.